Evan Pugh never went to college as an undergraduate, but earned a doctorate in chemistry. He never served in political office, but was a force behind the passing of the land-grant bill creating national public funding for universities across America. And although he died prematurely at the age of 36, he is remembered as one of the leading scientists of his generation. Roger L. Williams’s biography of him, Evan Pugh’s Penn State, tells the story of a remarkable life and his dedication to creating a remarkable university. Pugh grew up in Pennsylvania and remained a loyal son of the state his entire life. As a young adult he founded a boys’ school in his home. Feeling the need to advance his own education, he went to Germany (although he did not know German when he left!) and studied at several institutions there, eventually earning his Ph.D. He continued on to France and then to England, where experiments he did resulted in a paper that largely created the chemical fertilizer industry and transformed agriculture worldwide. While in Europe he was invited to become the first president of the Farmers’ High School in then rural Centre County, PA. He returned in 1859 to take up this post. He also taught several subjects (including chemistry) and even assisted in the construction of the main campus building and the president’s house. Along the way, he developed a plan for agriculturally focused universities that became the blueprint for land-grant institutions around the country. His scientific work was so well regarded that he was twice asked to take a position with the department of agriculture as their lead chemist. He rejected the offer to stay with Farmers’ High School–soon renamed Agricultural College of Pennsylvania, and later becoming Penn State University. In 1863, Pugh was injured severely in a buggy accident. His fiancee was also injured. They recovered well enough to be married, but the effects of his injury never fully left. Weakened by his injury and stressed by fights over funding with the Pennsylvania legislature, Pugh died from typhoid in 1864. The college he led so boldly for its first years struggled in his absence until George Atherton became president 18 years later. Atherton is often called Penn State’s second founder. Although I am not a Penn State graduate, I have lived in State College for 15 years. My wife and one of my sons both attended the university. It is a special place, and I have enjoyed living in the university’s neighborhood. Despite my long familiarity with the university, I never knew the story of her founder and first president. Roger Williams has written an engaging and illuminating portrait of Evan Pugh. Special emphasis is given to his scientific work in Europe and to his visionary writings about the role of agricultural education in the United States. Williams is clearly a fan of his subject, and his affection shows through the book. Occasionally the professor slips through in the writing. I doubt I’ve ever seen the word “peregrination” used twice in a single book before this one! But overall the book is interesting, easy to read, and tells the story of a long-forgotten American scientific and educational leader. It’s easy to play the “what if” game when someone dies at a young age. Evan Pugh was only 36 years old when he died. But imagining what he might have been can detract from what he actually did accomplish. 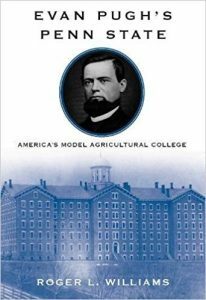 In his brief life, Pugh transformed agriculture and founded a university that has become one of the top 100 universities in the world! I commend Roger Williams for writing a worthy book on such an interesting figure. Anyone interested in agriculture, higher education, science history or American history will appreciate adding this book to her collection.